"Don't hit me don't hit me don't hit me....."
I never know how to start these things, so let's just get right to it. The past week for the Mariners hasn't been all sunshine and rainbows, but we're starting to see the potential in the players they currently have. I'm not talking about Kevin Millwood or Brendan Ryan. We know what to expect from those guys most of the time. I'm going to try to keep this short so you can all go back to your weekend and do whatever it is you do. Let me just say briefly that most of these games aren't really going to matter except for the Mariners playing spoiler to whatever teams are in the race. For the Mariners, and to an extent, us as fans, it's more about the individuals on the field and their quality of play. Has anybody improved? Is there anybody we might've whiffed on? Is Chone Figgins going to see more than four or five at bats the rest of the season? Is he finally going to go away? Will our televisions and computers survive if he doesn't go away? What's for dinner tomorrow? Wait, no, that's not right. Back on topic! Anyway, some very brief recaps from the past week after the jump. As I said above, this isn't about individual games. So let's see if they can win and do it with the young guys, since, you know, they'll be around for a while hopefully. On to the recaps! Since the first of September, the Mariners have gone 3-2 against the Angels, Red Sox and Athletics. Hisashi Iwakuma was the winning pitcher in Sunday's matinee against the Angels and Jered Weaver. If you had told me before this game that Seattle would be the victors by a score of 2 to 1, I would've laughed in your face and would never be able to look at you again without at least snickering. After the game I would have had to apologize profusely, but you get the idea. Iwakuma has gone from pitching a total of 15 innings combined in the months of April and May to there being serious talk of resigning the 31 year old pitcher. His ERA in July was 3.41 with a 2.08 SO/BB rate. The 2.08 is not very exciting, but Iwakuma is not a strikeout pitcher to begin with. Still, a serviceable 3 or 4 starter in the bigs is not out of the questions if they decide to resign him. In August, his SO/BB rate was pretty much the same, 2.09. Wow, a .01 improvement over July! He went 7 1/3 scoreless on Sunday and was provided offensive support by Montero and Carlos Peguero via solo home runs. Monday saw Jason Vargas bring out the home version of Vargas. That makes sense, considering they were in Seattle, which isn't Vargas' actual home but the home of the Mariners. I don't think he does anyway. I don't know, I'm not a stalker. Vargas went 7 strong innings against the Red Sox, allowing only 1 earned run with zero walks and five strikeouts. The offense was pretty punchless, but still managed to scrape together 4 runs in the bottom of the 4th and held the lead to win it 4-1. Now, when you read "against the Red Sox", you probably think the same thing I do. "The Red Sox huh? That's not too shabby!" I agree, not too shabby, but keep in mind, this isn't the same Red Sox team from even 2 months ago. They've still got the goods to make a pitcher look like a fool (see Beavan below), but let's not kid ourselves. This isn't the powerhouse we've come to know over the last few years. Blake Beavan was his usual boring self on Tuesday, only he decided to be different and lose this one rather than be like Vargas and Iwakuma, falling to the Red Sox 4-3. Beavan went 5 2/3 innings, giving up 4 earned runs with zero walks and one strikeout. His biggest issue going forward, not just this season but for his career, is going to be an inability to miss bats. That's not always a bad things, as he's had his share of decent starts, but Tuesday showed what happens when those bats make decent contact. Right now, we won't look too much deeper into the more advanced statistics and we'll leave it where it lies. Beavan had a couple of pitches that were knocked out of the park, but next time, he could go 8 scoreless innings. He is a pitcher that relies on his command to get him through lineups and when it's even a little bit off, his pitches get punished. It's nice to have Franklin Gutierrez back on the field, isn't it? Not only is he making playing center field look easy, he's actually hitting fairly well since his return. 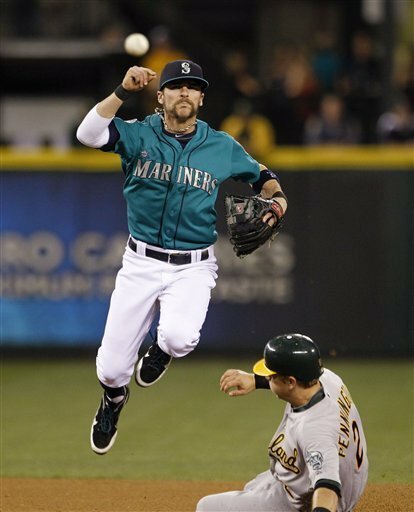 He and Kyle Seager provided 2 of the three runs in support of Beavan on Tuesday with a solo home run apiece. Time will tell if he can stay healthy and on the field, but if he can, he's worth holding on to until he falls apart in a heaping mass after making another diving catch. I'm not going to hold my breath, but man it's nice to see him out there again. Then we have Felix Hernandez yesterday against the Athletics. Felix did no Felixing on this day, Friday, September 7th. He's been so good the past 2 months or so, we've taken him for granted. Actually, ever since his velocity has come back and he's been absolutely dominant we've taken him for granted. Before that, worry was the special of the day. Felix having days like this remind us that he is, in fact, human. He went 4 2/3 innings, giving up six runs (five earned) on eleven hits, one walk and four strikeouts. Felix got hit, and he got hit hard. Again, this isn't the Felix we all know and love, but if he didn't have these kinds of starts from time to time, people might start worrying he's been replaced by a robot. I said these would be very brief. Didn't believe me? Well now you do! We're nearing the end of the season where individual game score don't really matter much. The bigger picture becomes the focus of the front office and to a certain extent, us. We don't live and die by the box score from September 7, 2012, but it's still not very pleasant. This is a time to see if Justin Smoak can show signs of life, although that ship is already out of the dock and getting it's sails unfurled. It's a time to see if Seager can finish strong, to see if Robinson can force his way into the conversation for one of the bench spots next year or possibly a platoon role. It's an exciting time to be a fan.